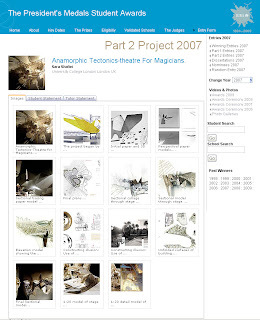 "With a plethora of means of representations not available to the analogue practice, Tobias provides an impeccable example of syncretism of contemporary CAD techniques and CAD/CAM technologies with historical architectural references, site-specific design narratives, and intuitive non-linear design processes. Although digitally driven, he does not succumb to the pervasiveness of parametric protocols. 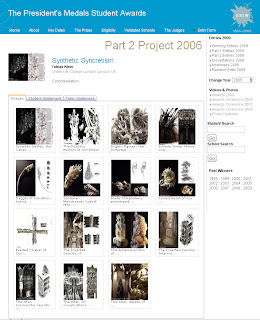 His portfolio is more than the display of extraordinary 3D modeling and rendering skills, it is a virtuoso performance of patience, precision and tremendous creativity that re-enacts a challenging architectural conversation on ritualistic objects, pre-Modern typologies, and religious ornaments. Who wonders about his nickname ‘Gaudi on Acid’?" "Far more than a display of patience, precision and creativity, Sara’s portfolio of beautiful drawings, poetic narratives, and stunning models, presents a building preoccupied with inhabitation, space, and structure. Look beyond the virtuosity of Sara’s surgically laser-cut magic; read the circuitous circulation, the subtle spatial complexity and enter a realm of continuous projections, performances and altered perceptions. Here, architecture is not about frills, gadgetry, or technicalities. It is constructed, choreographed, and meticulously contextualised; it is driven by contemporary structural, spatial and linguistic preoccupations. It is experimental and experiential, exuberant and explicit; It is secret, sacred and sublime. True magic." "As the only international hub situated on two continents simultaneously, Istanbul provides an extraordinary complex cultural setting in terms of its social, ethnic/religious and urban ambit. Damjan’s project for the Forum HQ for the Organization of Islamic Conferences masterfully integrates the city’s rich historic past with its increasing importance in world-wide politics; it interprets notions of local identity and global dimension. His portfolio is a very rigorous document that combines such concepts as investigations into 'de-focus' and cognitive illusions, synthesising a highly articulated tectonic proposition. For us, Damjan is a ‘complete’ architect who is able to theorise, project and build spaces that go beyond constraints of functionality and style. His project creates a vision that ultimately captures the sublime nature of Istanbul’s atmospherics." This is one of those projects that require a second and more profound reading of a multi-layered and multi-scaled approach to architectural design. Rather than following an immediately recognizable formal solution, such a non-linear process relies on a variety of techniques and preoccupations where typological (re-interpretation of function), topological (reading of place), and morphological components (experimentation with structure and materials) complement the ecological dimension of architecture. The project is multi-programmatic. It proposes a speculative design solution in which a water-filtering ‘biotope’ is combined with a ferry terminal and a neglected procession route on the axis of the main entrance of the Jerónimos Cathedral. The project is highly contextual. In considering the extraordinary historic weight of the site, it rethinks the urban voids left behind after the 1940 Grand Portuguese Exhibition, while also criticizing the hard-edged (often residual and derelict) Lisbon water front with the intervention of an unprecedented perpendicular (topographically determined) arrangement to the river. The project follows a green agenda. Rather than aiming for a linear technical solution (as so often in projects with such environmental preoccupations), it proposes a series of ‘green’ walls that grow algae vertically to filter polluted water. These biological interfaces are not mere cladding devices, but free-standing structural constructs that resemble large-scale sails on the edge of the river where the Portuguese discoveries once started from. 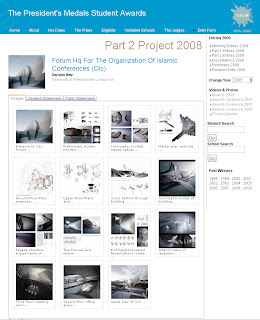 The project uses a variety of media. It explores 2D and 3D modeling techniques through extensive laser-cutting and rapid-prototyping processes without neglecting the assembling dexterity (and serendipity) of handcrafted models. The project is also extensively drawn and rendered with a particular focus given to the construction of perspectival models. This is a remarkable project in terms of its width and depth in scope. In contemporary education, it is more unique than rare to pursue a contextually driven and yet formally adventurous design agenda. Daniel’s project achieves what many of his contemporary peers may find unattainable: rigour beyond the domain of technique, vision beyond the realm of technology and performance beyond the veil of process.